Sweet shredded coconut is paired with tangy cream cheese in these easy, delicious coconut Easter eggs. We love the pure white look of these eggs, but you can use a regular chocolate coating or real chocolate if desired. The coating is easiest because it will remain hard at room temperature, while regular chocolate gets soft and sticky when warm. Place the cream cheese and vanilla in the bowl of a large electric mixer. Mix them on medium speed until the cream cheese is smooth and entirely soft. Scrape down the sides and bottom of the bowl and add the coconut, salt, coconut extract, and nuts (if using). Turn the mixer to low and mix until the candy is homogeneous and well-mixed. Check the texture of the candy: you want it to be firm enough to easily be shaped into an egg, but not too dry and stiff. If necessary, add more powdered sugar or cream cheese to get the right texture. Using a spoon, scoop up a small amount of candy and roll it between your hands until it is an oblong egg shape. Place it on a baking sheet lined with aluminum foil and repeat with remaining candy until you have approximately three dozen eggs. 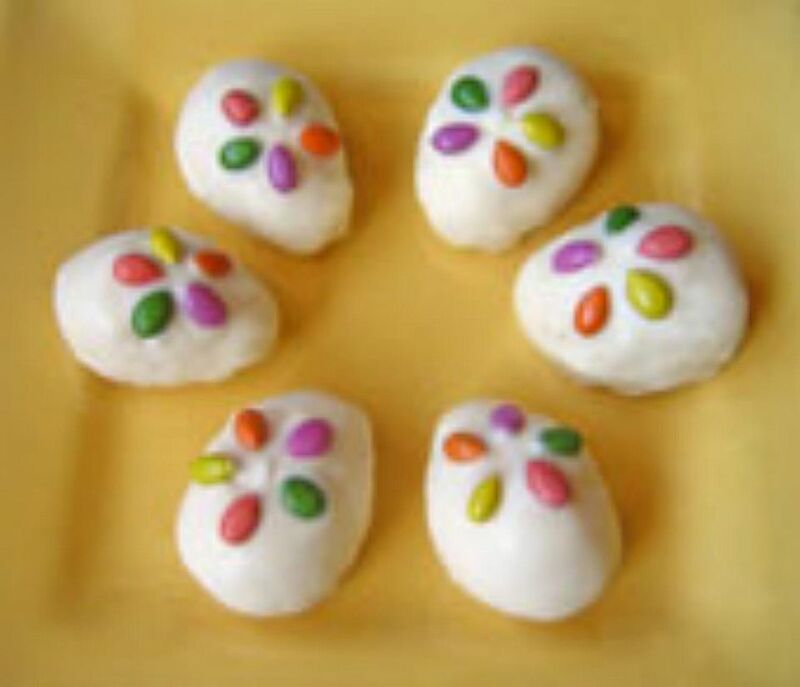 Put the eggs in the refrigerator to stay firm while you melt the white chocolate candy coating. Place the chocolate in a microwave-safe bowl and microwave in one-minute increments until melted, stirring after every minute to prevent overheating. Once the coating is melted, dip the eggs in the white chocolate coating and replace them on the foil-covered sheet. While the chocolate is still wet, decorate with sprinkles or other decorations of your choice. The eggs can also be sprinkled with coconut or left plain. Refrigerate for 30 minutes to set the coating. Coconut Easter eggs can be stored in the refrigerator in an airtight container for up to a week. They are best served at room temperature.